This piece was born out of my ongoing confusion about how to talk about the vision of living beyond right and wrong thinking. Two questions repeatedly arise, and I am not always satisfied with my responses to them. As different as they may seem, both, to me, are indicative of the same challenge. One question is some version of: “Are you saying that it’s OK to kill someone?” The other takes the form of: “Aren’t you saying that judgments are wrong?” My one word answer to both of them is simply “no.” So, what, then, am I saying? My rather arbitrary starting place in disentangling the many threads in this knot is to explore the significance of our choice of words. Saying that something is “wrong”, or “right”, or “beautiful”, for that matter, has consequences for the speaker as well as for the person hearing the words. This form of speaking assumes a standard of what these words mean that is external to the speaker and the listener. The speaker is not taking full responsibility for being the one making that judgment. The listener is subtly invited to agree with the speaker rather than to understand the speaker. The ensuing conversation, if one takes place, is less likely to be one of exploration and connection than one of making pronouncements and, in the case of disagreement, debate, possibly acrimony. If, instead, the speaker speaks of their experience, what they say becomes incontrovertible and invites a different quality of relating. No one can argue with me about whether or not I liked a certain movie. Anyone could argue with me about whether or not this was a bad movie. Speaking of our own experience, our own inner frame of meaning, and taking responsibility for that being my frame instead of some truth that lives outside of me, has different effects. For myself, based on years of learning, practicing, and teaching, I can say with definite clarity that I prefer the consequences of speaking without judgments to what happens when I use judgment words. The quality of connection and dialogue, and the capacity of people to work together to create something they can both live with, increase with the former. In part, this is because saying things from a personally owned perspective tends to be more vulnerable and therefore, again in my experience, invite a response that is also more vulnerable. In part, this is because when the speaker expresses things in that way, there tends to be more of an explanation of a “why” that the other side can then relate to. My favorite example of this kind of shift is what happened when the Public Conversations Project brought together people from across the abortion debate. People were asked to speak of their values and life experiences that led them to have the positions they had, rather than about the positions themselves. The result, after a few years of continued conversations beyond that original event, was that six leaders of opposing movements co-authored an article in the Boston Globe in 2001 titled “Talking with the Enemy”. This is a moving account of how, in the face of some of the most entrenched differences in positions, these women came to love and respect each other. None of them changed their positions, and nonetheless they could engage with each other, even collaborate to prevent violence in abortion clinics. Although I want to meet Rumi in his field “beyond thoughts of right-doing and wrong-doing”, I also know that we are constantly making judgments and evaluations, and I have no desire or interest in changing that fundamental human activity. I simply want to change the kind of judgment that I make. From the perspective I have on the world, in which human needs are at the center, I find it immensely helpful to recognize and aim for continually making judgment calls about what meets needs and what doesn’t, which path is more likely to contribute to well-being and which path is more likely to contribute to harm. These are judgments that are based within me, relying on my own values and understanding of the world, without reference to external authority, implicit or explicit. This is a form of judgment that is a constant act of discernment about life. My own concern is about the kind of judgment that implicitly relies on an external authority. When I say “It is wrong to do so” rather than “I am disturbed about this act,” I am implying that the “wrongness” is external to my own evaluation, exists there, in some objective reality. In my view, this is precisely what creates the harm from judgments. Based on my own evaluation of human history and my own experience of working with people, I am confident that significantly more harm has been done by individuals and cultures who use that kind of judgment than those who only or mostly use judgments that are based on needs and values that are recognized as such. This statement I just made, in itself, is a form of value judgment. The value in question is my own deep care for life, from which emerges my desire to choose actions and forms of speech that I believe will serve life more fully. This, to me, is a far cry from saying that judgments are wrong, or even that there are two kinds of judgments, and one kind is wrong. I am evaluating based on consequences to what is dear to me. No discussion of judgments would be complete for me without addressing the question of so-called positive judgments. If my concern is about harm, I often hear people ask, then why would I have an issue with judgments such as “good,” “wonderful,” “generous?” What harm could possibly be done by that? Doesn’t it contribute to well being to be told that we’ve done a good job, for example? I have three responses. First, on the most personal level. I am someone who has been praised — about certain things — my entire life (along with being criticized for many others). I still remember how unpleasant it felt to be set apart from others by being seen as “better”. It never felt supportive or nourishing. Since I started teaching NVC, I have become even more attuned to what I want that would be nourishing instead of being told “this was a great workshop.” I want to know in specificity what happened for the speaker that was meaningful for them. That is how I get learning value in hearing from them. I want the same when they are not happy with the workshop. I don’t experience connection or meaning through the judgment. The second is extensive research that shows – sufficiently to my satisfaction – that praise and other rewards can be just as harmful as punishment. 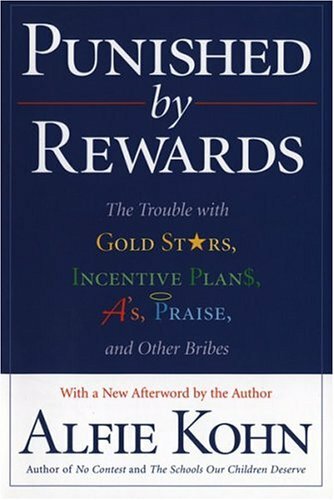 In fact, Alfie Kohn wrote a book called Punished by Rewards which examines the effects of rewards in schools, among other places. I know that rewards and positive judgments are not exactly the same, and yet I see similarities in terms of the unexpected effects. Dan Pink has a YouTube video that discusses the growing evidence that reward decreases performance in all but the most mundane of tasks. I simply want us to look deeply into these questions rather than assume that praise and rewards have an unqualified positive effect on people. Even if not, I know I want to release myself from the grip of the habit of judging. This habit is reinforced any time I judge, regardless of the content of the judgment. For any of us who want to free ourselves from judgments, I simply believe that we get there far faster if we work on the positive as well as the negative. Learning to take responsibility and full ownership of our experiences, feelings, evaluations of things, our needs, wishes, and actions — this is a serious project that puts us on a different path from how the culture at large operates. Given the pervasiveness of this habit within and around us, I know I want every opportunity to practice a different way if I am to ever reach integration and spontaneity on the other path. When I say that I don’t hold judgments to be “wrong,” and that I want to base my choice of words on the consequences I anticipate from using them, I mean it very literally. Just as I was in the process of reflecting internally on the topic in preparation for writing this piece, a conversation took place with a friend, let’s call her Nancy, who was agitated because a friend of hers said to her that “evil” was not a useful concept. This happened when they were discussing the actions of police toward African Americans in Oakland. Nonetheless, I happily managed to stay focused on understanding Nancy instead of getting involved in the content of the issue. Nancy brought the issue up because she wanted to know how to talk with her friend about the topic. I was, in fact, honored that she chose to talk with me knowing what my position is. Instead of debating the question of evil, what we did instead is look at what was so important to Nancy about using this term. We identified a few elements of great significance. Partly, calling on an external reference was a way, for her, of trusting that the seriousness of an issue would be believed. Coming from a history of abuse in which Nancy’s experience was not believed, she wants people’s experience of harm to be fully recognized. Partly, it’s a sense of solidarity with the people being harmed. Naming what happens to them evil lets them know that they are not alone with the experience. From this conversation I got to understand more fully why I might sometimes choose to use a word such as “evil” or any other judgment. This is no different than any other act of stepping into someone else’s shoes and worldview in order to create connection and understanding. It is my choice, and my choice alone to transcend the habit of making these kinds of judgments. I am obviously putting it out — here and when I teach, for example — because I want more people to embrace this choice, because I have more faith we can reach a livable future if we do that. It is not my intention, ever, to try to “teach” someone who has not chosen to be taught by me. If someone were to come to me to express their distress about what police has done to them, I want to be able to choose to use their language and call it “evil” if I thought this would be the way to convey understanding better than to reach for and name the person’s needs. Ultimately, I want my choice of language to be given by my purpose, not by any sense of “rightness” about the language. I’d like to believe that I can stay true to this intention in moments of challenge. This entry was posted in Uncategorized and tagged arguments, evil, judgments, relationships on August 10 / 2012 by Miki. Ron, I like your reference to "discernment," which to me emphasizes the experiential nature of effective judgment. Without our experiencing our need, judgment tends to take on a life of its own, so that we fail to experience that personal vulnerability that dissolves the hardened defensive boundaries that prevent real contact. I love your commentary on certainty. The Creator bestows upon us what we most need in abundance and what we need less in scarcity. Humanity's current approach in to place more value on what is scarce and less (take for granted) on what is abundant. We have a values problem: they're upside down! Very interesting post. I value NVC for helping me live outside of the constraints that our culture's value system puts on our thinking and behavior, because I really value authenticity, creativity, and intimacy with life. I used to get trapped in thinking judgments were 'bad'. It's hard to shake off my habit of judging.